These Del Ray homeowners live in what they call a typical Del Ray duplex. With an addition on the back, they are fortunate to have a pretty spacious home, but the problem, which many Del Ray families can understand, is what to do with all the stuff. They won our second special offer for a 50-percent discount on a two-hour home design consult with professional interior designer, Katie Moore of Olios Design. Our first winners were Warwick Village homeowners Eric and Beth, who had their consultation with Katie a few weeks ago. 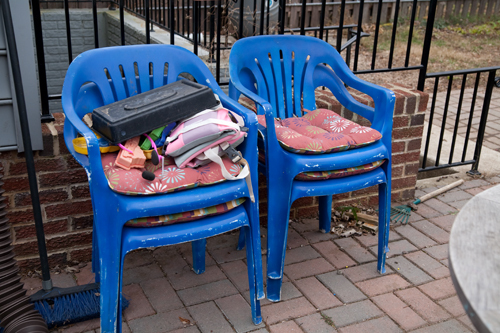 The homeowners really wanted help sprucing up their outdoor patio space, updating the dated and worn chairs, finding a more appealing way to seat 10-12 guests for dinner and accommodating their two young children and their friends. They entertain often in the summer months, when they have a well-tended summer garden, and the children often use the table to make crafts. Move the grill back a foot or so since there’s still room behind it on the brick. Use the round table off to the side as a dessert and drink serving table. 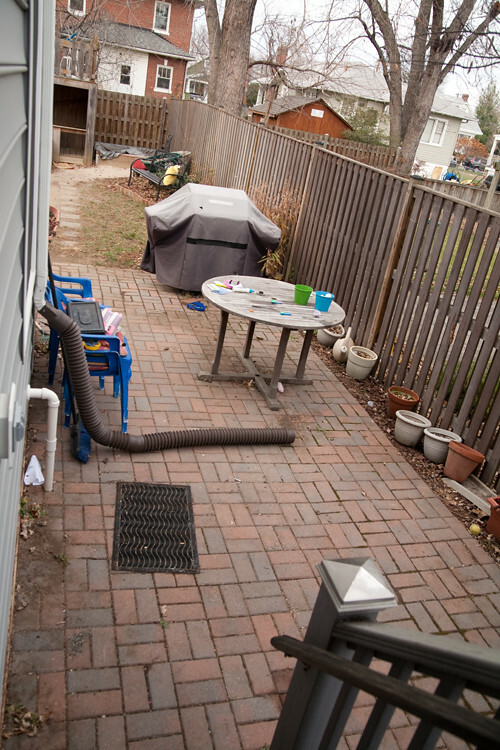 There’s also a nice paved space around the side of the house where they could use the round table in the same way. 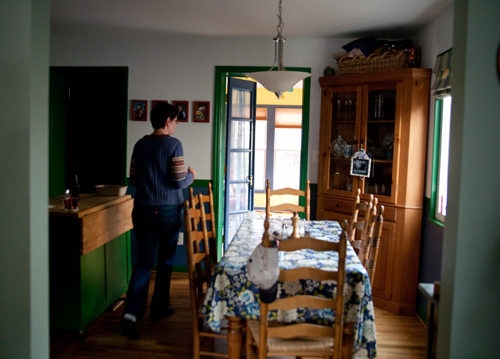 Use long benches on either side of the long table that they can push under the table and preserve space. Then, they don’t need the stackable chairs. We went down to see the finished basement that has a black-and-white checkered linoleum floor and cabinets and shelves against the walls. 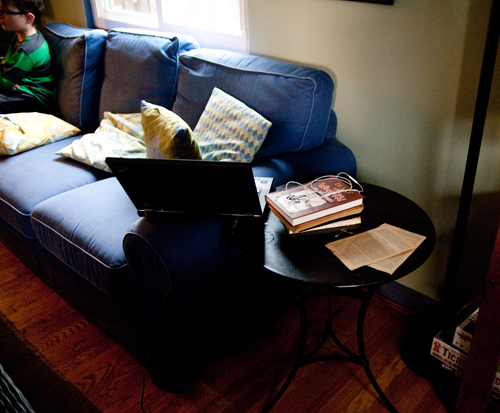 The space currently serves two purposes: as an art studio for the kids and also as a seldom-used office space. They have a nice big table in the center of the room that the kids use for craft-making. The kids have free rein to make messes. 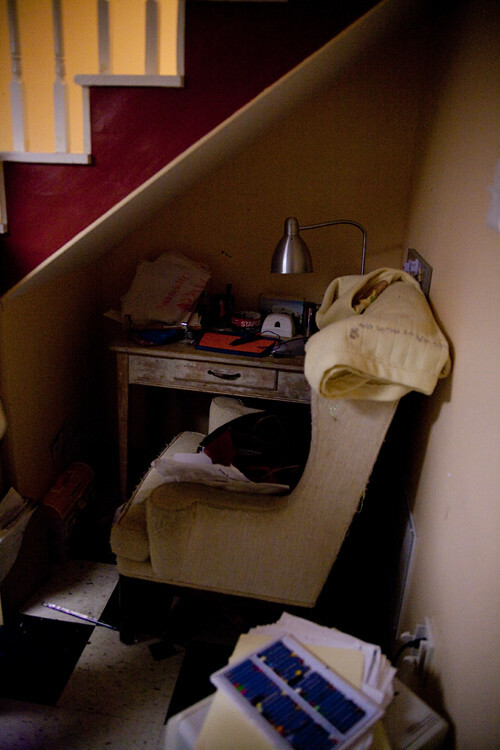 The main issue in the basement is how to use the space under the steps, where they’ve currently situated another small desk. They’d really like to turn that space into an office for their 6-year-old daughter who is desperate to have her own desk and workspace. Move the big chair out of the house (the homeowner admitted she planned on putting it on the curb). Keep the desk and add storage, maybe with a mobile pedestal that rolls, or replace the desk with one that has more storage. Since the desk has sentimental value and is in great condition, she’d suggest they keep it there. 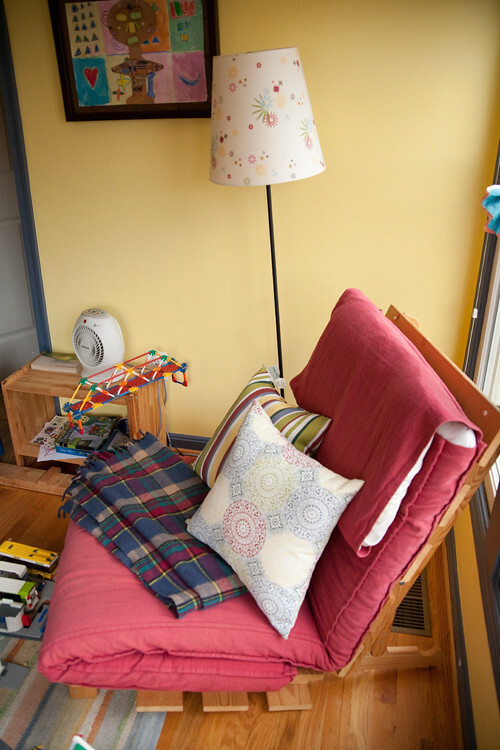 Replace the existing light fixture with a task lamp, especially if the daughter uses the space for homework and smaller craft projects. 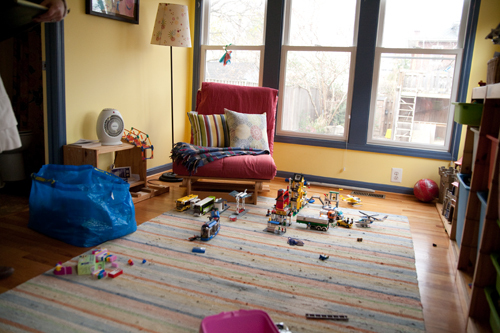 The other main goal for the whole house is to find useful and attractive ways to contain the clutter that naturally occurs from living with kids. 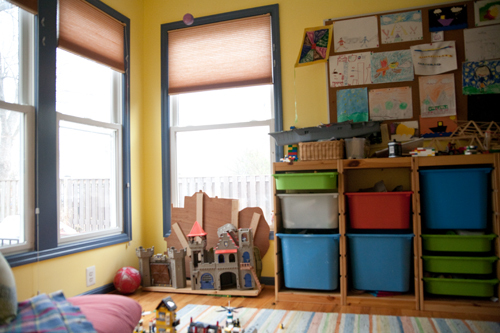 In their sun-drenched back room, which they use as a playroom, they like the IKEA bins. The kids can pull them out and even take them to other parts of the house and then bring the entire bin back. Their son will often bring the bin with trucks out to the back yard and their daughter and her friends will bring the dress-up bin upstairs. The room also serves as a guest room from time to time. But, this chair is not used all that often. It’s just taking up space. The kids love to spread out on the floor which is just fine with the parents. So, to maximize the floor space, they are going to move the chair elsewhere. Against the wall, they could buy an armoire with drawers, so they can store some toys away neatly that don’t fit in the bins. Then, when guests come, they also have room for them to keep their clothes. They can also put a sconce on the wall for lighting. The standing lamp is just using precious floor space and the homeowner admitted she wasn’t in love with it. Katie also recommended using more wall space to display the kids’ artwork and their lego constructions. She’s also researching Flor carpet tile designs — they’re so easy to clean and don’t cause a tripping hazard that can occur with area rugs. Upstairs in the kids’ bedrooms, Katie gave some great ideas for again, harnessing the toys and art projects that naturally occur with having kids. She suggested more shelves on the walls where they can display their creations. That way, a lot of the clutter on flat surfaces can be whisked away. 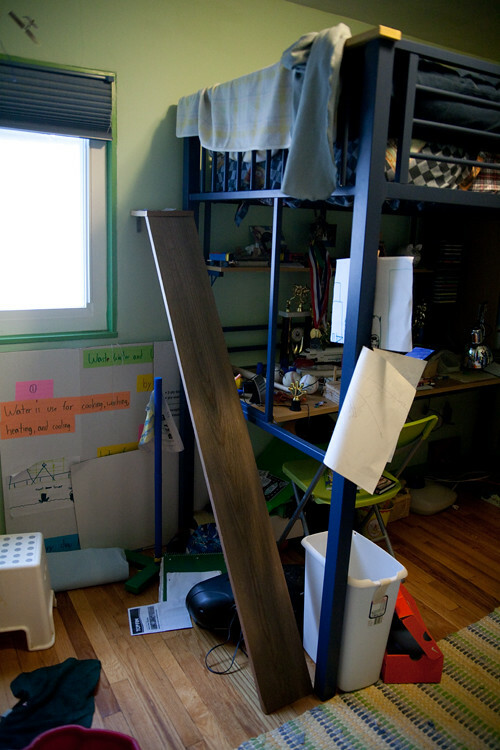 In the closet, the shelves are given over to their son’s trains, but these can also go on shelves in the main part of the son’s room. She can then give him bins to use in the closet for odds and ends. 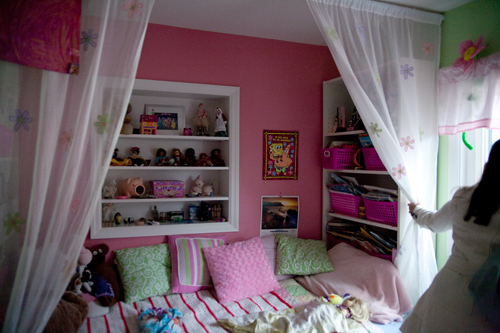 In their little girls’ room, they have this darling daybed and two IKEA shelves flanking either side. 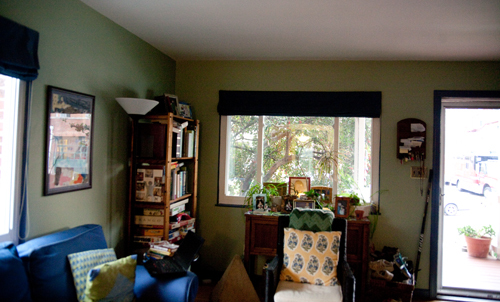 The shelf in the back is great — it used to be a window. When they had an addition put on to the house, the contractor saved the space for a built-in shelf. It’s perfect for a little girls’ collection of dolls, piggy banks, and other precious keepsakes. 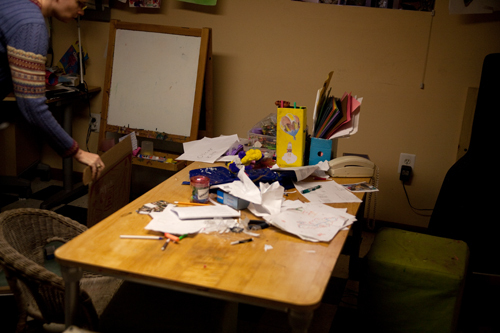 Katie’s focus in this room is just to consider the idea of finding room for a desk, as an alternative to the basement location. She has a large doll house under the window on the right side that they could perhaps move to the basement or playroom to allow space for a desk. They also talked about adding a custom wall-attached desk that could fold down when not in use. In the living room, they have solutions in place for coats, shoes, hats, and other accessories. One problem is a definite stumper for them though. The husband likes to have his laptop open and within reach. So, he props it precariously on the edge of the couch. It has fallen off before! With active kids in the house, this is a problem in desperate need of a solution. Katie is going to research laptop friendly tables for him to use. For the front room, she also suggested updating the window treatments, either with heavy curtains or a sheer, to create height in the space. The homeowners seemed energized to make these changes. We’ll check back soon to see how they’re doing. Maybe we’ll crash one of their summer gatherings to see the new outdoor seating in action.